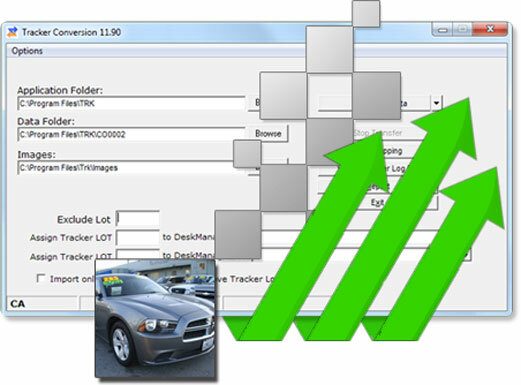 The Tracker™ data conversion utility allows you to easily convert and import your data and image files from Tracker™ into DeskManager. Change doesn’t get any easier than this. With our data conversion tools, you can have all your old data transferred to your new DeskManager account, and in perfectly organized fashion. DeskManager can import data from 27 different sources, including Tracker Suite™ and Tracker DMS™. Many data converters will only preserve your text and numerical data when switching between applications. In many cases, we can transfer any pictures that were attached to your inventory items, so you won’t have to retag your photos in the new system. related to Finance Express LLC. Nor is AutoManager’s DeskManager endorsed or sponsored by Finance Express LLC.